The US company, Apple has recently announced its new iPod Touch. Here’s more details and specifications for the iPod Touch. 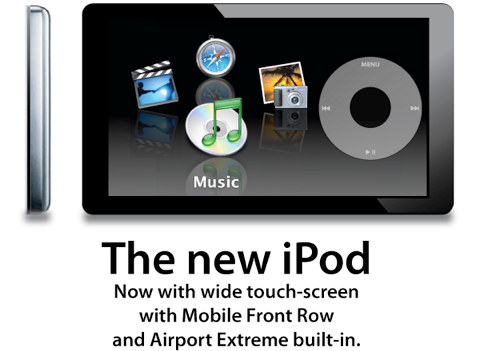 iPod Touch measures only 8mm thick, the latest portable media player with 3.5 inch touchscreen display (480 x 320 resolutions), album cover flow, YouTube built-in and Wi-Fi connectivity. Besides, the iPod Touch also features a new application which called as iTunes Wi-Fi Music Store, allowing the users to search, previewed and buy songs wirelessly from iTunes. Furthermore, this new application will also come to Apple iPhone in coming late September as a free software update. Besides, Apple is stop the production of the 4GB iPhone and dropping the price of the 8GB iPhone to $399, $200 cheaper than before. It’s a bad news for people who already bought Apple iPhone. In addition, the company also announced the release of its new iPod Nano and new iPod Classic. Both models will be available in this month. The new iPod Touch that available in 8GB and 16GB version will hit the market later this month for $299 and $399 respectively.